Huge Luxury Chalet with AMAZING views. LIKE NO OTHER! The front door and driveway are level with the street, making access to the house very easy. No steep driveway to navigate or entry stairs to carry all your belongings up to. Down one level is the game room with wet bar, conversation pit w/ woodburning stove, indoor spa, gym, laundry room, 2 bathrooms, and two bedrooms, 1 w/ King bed and 1 w/ Queen bed. Our group absolutely loves staying at this property. We go to Big Bear for Memorial Day every year with a group of 14-20. We have stayed here for the past two years and each stay was perfect. There is a ton of room to accommodate our entire group. Travis, the owner, is the easiest person to work with when it comes to making the reservation. The cabin was clean each time and the kitchen was stocked well with everything needed to cook. This cabin is highly recommended! My friends are I (17 people) stayed at this huge chalet. Everyone love the place and we were able to accommodate us comfortably. We are planning to do this again in the summer. Overall, we were able to take advantage of their theater and watch a movie-like screen experience, played pool, went to the indoor Jacuzzi. The view outside the place was remarkable. And the amenities were all there; as we were able to cook and grill. We had four families enjoying nearby skiing and snow boarding. The Chalet was beautiful with various activities for adults and children throughout the floors. The adults and children enjoyed the indoor jacuzzi, pool table and movie theater room. The owner is very responsive and helpful. Thanks for the memories. I'm so glad that you enjoyed your stay! Thank you for taking such great care of our house and for writing a review. You were wonderful guests and are welcome back anytime. Not impressed for the price we paid. First off, I will start off by saying that it was our fault for not communicating well that our pet sitter bailed. We brought cages to keep our dogs in throughout the time we were there, aside from letting them use the bathroom outside. Now let me get started, for the price we paid for 2 nights and 3 days well over $5000 (during New Year Eve and New year) was not worth it at all. We arrived to the house with pet urine stains all over. It seems like nothing in the house was well maintained or upkept. We booked this with the idea of using the pool table and other amenities inside the house, that were listed in the discription upon booking. The pool table was broken, along with all pool sticks. You would think for the price we paid, the pool stick could at least be replaced. Now, the hot tub water was yellow and had this moldy smell to it, we know it’s inside so the smell of chlorine is suppose to be strong, but not throughout the whole house burning everyone’s eyes upon entry. Now, the balcony, is ridiculous and unsafe, especially for children. Walking on the balcony was loose and squeaky and feels extremely unstable, some of the floor boards were unattached. If you look at all the rails, they were all slated. The room with the bunk beds, one of the bottom bed is unable to pull out due to the closet being in the way. One of the shower has a broken shower head. The grill took forever to even start up, due to it being the way it was rigged up to the gas line. Moving on, we really do see a big potential if this cabin can be fixed up, updated, and new accessories required for the games inside. This is really an unfair review. These guests said they weren't bringing any pets (and signed the rental agreement stating the same), but then showed up with 3 dogs. One of which was literally the size of a small horse. Not wanting to ruin their vacation, I reluctantly allowed them to stay. We do allow pre-approved pets on a case by case basis and have never had a problem with guests not cleaning up after them. When these guests checked out however, we found urine spots in the carpet and dog hair everywhere on the furniture. They didn't bring cages with them, as she stated (the dog hair everywhere proved that). I can't imagine they even make a cage big enough for this horse-sized dog, and if they do, it would be an act of animal cruelty to keep a dog of that size in a cage. Anyhow, I brought in extra housekeepers to do a deep clean throughout the house and had the carpets professionally steam cleaned. I only charged them for the carpet cleaning, thinking that was incredibly fair. Minutes after they received the remainder of their deposit back is when I got notice of their review, so I believe this was done purely in retaliation. For them to lie, break the rules, cause damage, and then write a 1-star review just doesn't seem right to me. To all future guests, please know that we love this house and take great pride in it and want our guests to love it to! If you find anything unsatisfactory, let us know and we'll make it right. Had these guests mentioned any issues to us during their stay, we would have taken care of them immediately. The spa was just serviced hours before they checked in. The deck is perfectly safe. The grill is hooked up to the house's gas line, so running out of propane is never an issue. And a broken pool que? No problem! We've got tons of them and could have had it replaced for them in minutes! Thank goodness we have over 35, 5-star reviews to offset this one, 1-star review. We spent Thanksgiving and the weekend at this wonderful luxury chalet with 15 other family members. It is spacious, and the views are breathtaking. The cable for the tv didn't work, which originally concerned us because of all the football games we would miss. In the end it was better, because all the family then participated in the crazy games. We did go to a sports bar for a couple of games, but in the end we really didn't miss not having television, a the theater room was amazing. The young adults watched movies till after 2am each night. Thank you for taking such great care of our home and for taking the time to write a review. I'm so glad you and your family enjoyed your stay at our chalet! Sorry we couldn't get the cable TV issue worked out during your stay. It ended up requiring a service call from the cable company to fix the problem, but it's working great now. 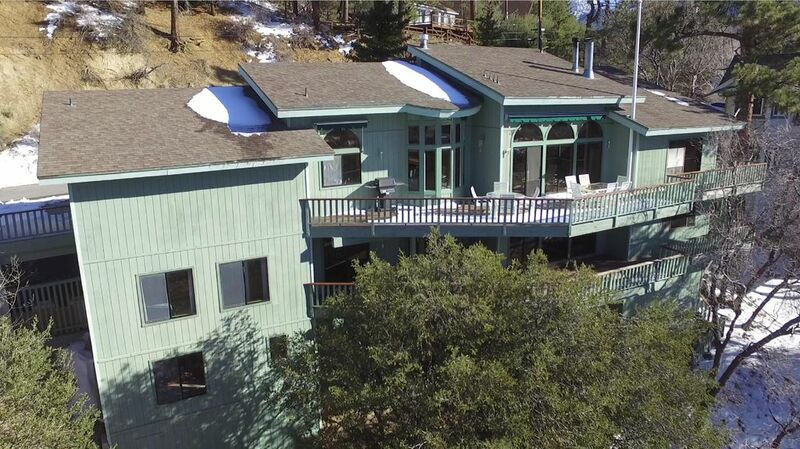 If you plan any other trips to Big Bear, please keep our home in mind. You're welcome back anytime! Most Holidays - 3 Night Minimum. Pets Considered. Pet fee is $35 per pet per night. *Refundable Security Deposit Required.